Christian Dior was born in the Normandy coast region of France but later moved to Paris. He served in the Army for France during WWII and his sister was actually placed in a concentration camp during the war due to her activity with the French Resistance. 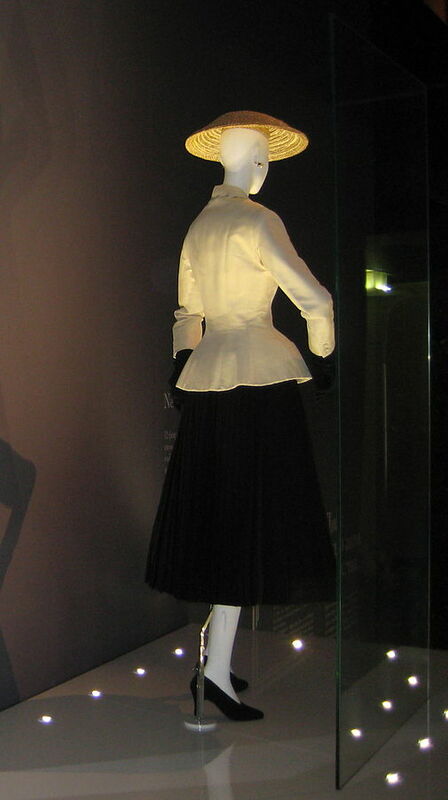 He was a master at creating shapes and silhouettes, using fabrics like percale, as well as boned, bustier-style bodices that made his dresses flare out from the waist. It may seem strange to us now, but his dresses were controversial because they used more fabric than was allowed during restrictions at wartime. He died in 1957 at the age of 52. Enter Raf Simons. In April 2012, it was announced that Simons would replace Bill Gaytten as creative director at the helm of Christian Dior. Simons’ first collection for Haute Couture Fall-Winter 2012 was well-received as the designer focused on the 1950s by playing with some of Christian Dior’s famous silhouettes: the A line and the H line, and the Bar jacket. But, he is not without controversy. Raf Simons has been repeatedly accused of racism because of his refusal to accept models of color on his catwalk shows. Dior and I is a feature-length documentary that takes the viewer behind the scenes of the creation of designer Raf Simons’ first haute couture collection for the legendary Christian Dior fashion house in the spring of 2012. Granted unprecedented access, the film documents the eight stressful weeks that Simons had to complete his debut collection. Revealing the inner workings of the design house, from the creative processes of its artistic director to the tireless seamstresses of the atelier, the film explores the personal bonds that form between the collaborators, their work, and the legacy of Christian Dior. I can’t wait to see the film. You can see the trailer below.